It is that time of year again.... Beta 5 Ice Cream Socials! I literally look forward to the weekends in anticipation of finding out and trying the new sundae creation that Beta 5's fabulous pastry team comes up with. And this weekend did not disappoint! However, I was super bummed that I could not attend last weekend's Beta 5 Ice Cream Social which was the official first sundae of the season --- Cherry Cola -- but I have my fingers crossed in hopes that they may do a repeat of that sundae flavour sometime later this summer. 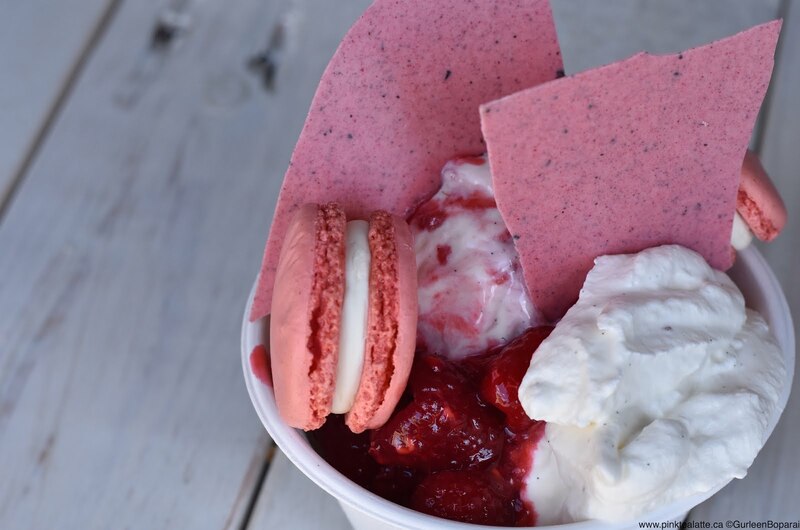 In celebration of Canada Day, Beta 5 came up with the Raspberry Earl Grey Sundae, a red and white treat to reflect Canada's two colours. I literally get excited for the small details like that one. Haha I think it is super cute. 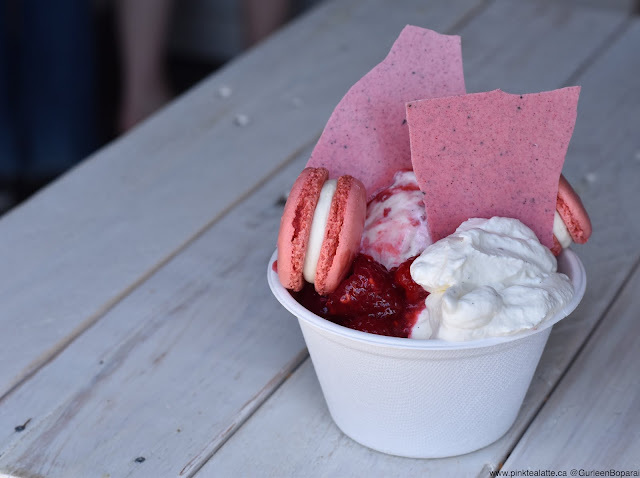 This sundae featured a scoop each of the Earl Grey and local raspberry swirl ice cream, topped with fresh raspberry compote, two earl grey raspberry french macarons, their house made vanilla chantilly and as a garnish, some shards of raspberry earl grey chocolate. Believe it or not, but all of Beta 5's weekly ice cream sundae's are just as complex and sometimes even more! Not only was this sundae delightful to stare at, a little cold treat work of art, but it also tasted amazing. Mangoes are my favourite fruit, but raspberries and strawberries are a close second for me. I love the tartness and sweet flavour of a raspberry and how well it pairs with other flavours. The french macarons were yummy, but I do not think they added to the sundae. The compote was delicious and I appreciated how they tried to keep a lot of the raspberries still whole. My only complaint would be that I think they gave me two scoops of the Earl Grey ice cream and not one of each of the two ice creams. I really wish I got a scoop of the raspberry swirl ice cream because I am sure it would have been amazing. For future Ice Cream Socials, I hope Beta 5 does a sorbet scoop too. I find two scoops of ice cream ends make the sundae really heavy. The sorbet generally gives some freshness and almost cleanses your palate from the creaminess of the ice cream and chantilly creme. I cannot wait to find out what next weekend's sundae flavour combination will be! I really hope they do a citrus and chocolate duo. I think that would be yummy! Also some mango sorbet because mangoes are my favourite fruit! I think I might do a icy treats series for this summer since various cold treat shops have been popping up all over Vancouver. Let me know, do you like the cold confection posts? I will definitely keep doing the weekly posts on Beta 5's ice cream socials because they are delicious and so pretty to photograph! That looks so delicious! I must try it out!